With the Olympic Winter Games just around the corner in February, the winter season is already well under way. 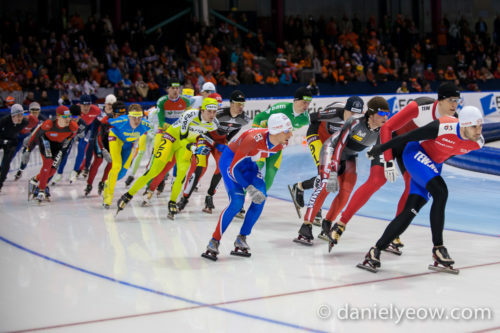 In the sport of speed skating, the first major qualifying event will take place this coming weekend in Heerenveen, The Netherlands. For those of you who are wondering how an athlete qualifies for the games in the sport of speed skating, I have explained it at length in a previous post. There have been some small adjustments to the numbers here and there, and I will probably write again on the matter to explain what these small differences mean, but suffice to say that the essence of the selection process is the same as in previous years, save for one big difference – the Mass Start. The mass start is a brand new event in the Olympic schedule. Not only is it a new event, but it is fundamentally a very different animal to the rest of the program in long track speed skating, and it is the first new event we have seen since the introduction of the team pursuit in Torino 2006. In all of the individual distances, athletes skate in individual lanes for the duration of their race, effectively racing against the clock. In the team pursuit, teams of three skaters compete against each other in a knockout-style tournament by racing a set distance, but each on opposite sides of the track. In the mass start, a large group of skaters race together in a large pack, not unlike running or cycling races. Those readers who have followed my exploits in the past will know that I originally came into the sport of speed skating on ice through speed skating on inline roller skates. 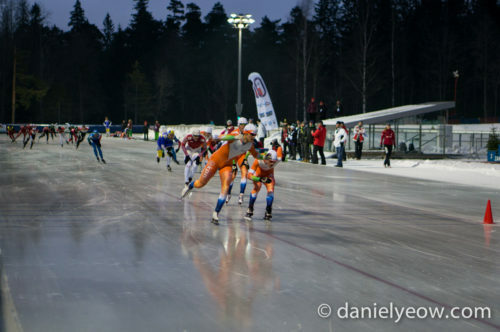 Inline racing, as well as the sport of marathon ice skating offer the two closest established sports with which to compare the new mass start event. It is clear that a certain amount of inspiration came from both these sports to establish what we now know as the mass start. It is also possible that a chunk of sporting DNA also came from short track speed skating. 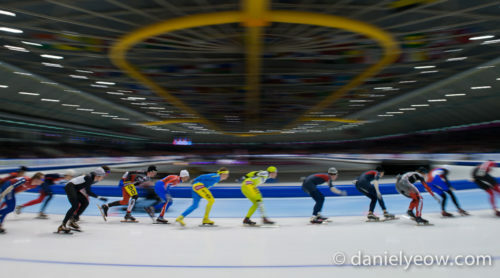 Unsurprisingly, the long track skaters who have been successful in this new event so far have often had a history of inline skating, marathon, or short track (coincidentally, all four of the inline skaters in the above photograph have competed at world cup level in ice speed skating). The race begins with up to 24 skaters being lined up in the middle of the finishing straight (1000m finish line, for those familiar with the long track layout). The order of the starting lineup is determined by the points ranking of the competition’s series, be they junior world cups or senior world cup competitions. If that particular start is the first race of the season, the draw is random. If more than 24 skaters are entered, then semifinals are held with the first 8 skaters from each semifinal advancing to the final. On laps 3, 7, 11, and 15 a bell is rung to indicate a sprint. At the end of laps 4, 8, and 12, the 1st, 2nd, and 3rd skaters are awarded 5, 3, and 1 point respectively. At the end of lap 16 (at the end of the race), the 1st, 2nd, and 3rd skaters over the line are awarded 60, 40, and 20 points respectively. The person with the most points at the conclusion of 16 laps is the winner, and all subsequent rankings are ordered by the number of points the skaters have obtained. Any skater who is lapped by the leader loses their points and is ranked according to the number of laps completed when they were lapped. Between now and Pyeongchang, there are 3 mass start races (at the Heerenveen, Calgary, and Salt Lake City world cups), and the top 24 ranked skaters at the end of these three races will qualify for the games. In addition, a quota restriction of only 2 competitors per gender per country may qualify for the games. Those readers who are paying attention will immediately notice that the results of the intermediate sprints don’t make a difference to who comes 1st, 2nd or 3rd. You would also be forgiven for scratching your head and asking questions like “why 16 laps?” and “what is the point of the intermediate sprints?”. One could equally ask why we run 100m, or why the men’s discus is 2kg. The truth of it is that the rules and regulations which govern sports are fundamentally arbitrary in nature. So long as we all agree on, and are aware of the rules, then it’s (a) fair game. As it is with so many things, we must examine the history of the event and its origins to really know the answers. What we find, funnily enough, is that some of these stranger things are themselves simply answers to questions. I’ve been in a fortunate and unique position in that I’ve witnessed the very first “experiments” of the event at senior world cup level, and have also been quite actively involved in the well-known testing ground for new ISU events – junior world cups. The first forays into mass start events at senior world cup level were clearly inspired by marathon skating. As you can see from the first photo in the article, they featured a similar number of starting skaters (many more than 24) and a similar number of laps. They even threw some dutch marathon skaters into the mix, presumably to show them long trackers how it’s done. At the end, the race was won by a marathon skater and featured a few crashes including one at the finish line involving future Olympic gold medallist Jan Blokhuisen. It wasn’t tried again at senior level for quite some time. Ultimately, I believe the International Skating Union wanted to add a new event to the program, but they needed something TV-friendly. So they experimented with the format using junior level competition to get the mix right. This is not altogether a terrible idea, and if I had been in charge, it is probably how I would have done it. But from the point of view of a coach of a junior national team, it was extremely frustrating having to deal with officials who were uncertain themselves of how the event was supposed to be. Marathon distance was clearly too far. Long track skating events range from 500m to 10,000m (which itself is not frequently skated) while marathons typically go for just over 42km. Not only was the distance unsuitable for reasons of poor physiological adaptation on the part of targeted competitors, racing 40+ km on a 400m track means over 100 laps of grinding away on ice of rapidly deteriorating quality. 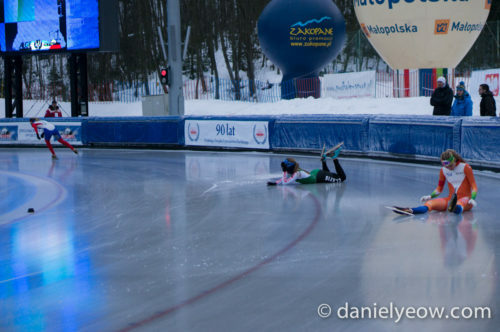 In ice marathon events, track stewards move the track slightly as the race progresses in order to even out the wear on the ice – but even then ice conditions are difficult to skate towards the end. They could have decided to leave it as is. To have this one event which was significantly different from the others, and which could potentially attract separate, specialised skaters who were different from the regular long track crowd. But in the end, I believe the pressure of TV friendliness was a deciding factor in shortening the distance significantly (how many people do you know sit and watch a running marathon from start to finish?). A few different distances were tried, but I believe 16 was a compromise that allowed the ice conditions to still be good enough for a fast (TV-friendly) sprint to (safely) happen at the end. In an uncharacteristic move, the final distance of 16 laps was settled on for both ladies and men’s events (recall that ladies skate 500, 1000, 1500, 3000, and 5000m, whereas men skate 500, 1000, 1500, 5000, and 10000m, and the team pursuit is 6 laps for ladies and 8 for men – nobody knows why). For several years different distances were skated by different genders, but in the end I believe they settled on the same number so that both would have the same number of intermediate sprints. Even at junior level competition, the distance is the same even though there is only one intermediate sprint making it relatively easy to have different distances. I think this is so that the junior world cup and world championship programs follow the senior programs as closely as is practical. At the time that the mass start was first tried, the safety requirements for marathon skaters were relatively relaxed. The front and back of the blades must be rounded (no sharp points) and cut-resistant ankle protectors and shin protection was required. The rules for the mass start in long track initially followed those of the marathons. However, on realising that the speeds were greatly increased because of the decrease in the race distance (and accompanying higher quality ice, allowing still higher speeds) the safety requirements for the mass start have gradually become more stringent. It took one or two mild concussions (and thankfully, nothing more serious) for the helmet rule to be added, with this change also being implemented in the dutch marathon circuit. 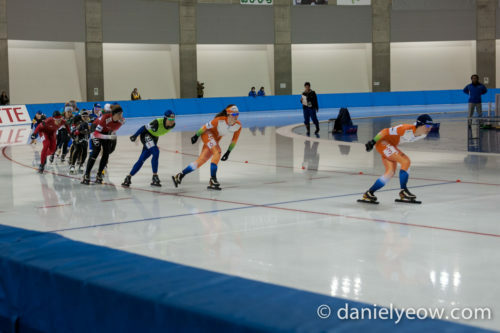 And finally, thankfully without the need of any blood-letting crashes, someone had the good sense to implement the same cut-resistant suit rule to the mass start as already exists for short track speed skating, perhaps as recognition that top long track skaters have top speeds which are much, much higher than top marathon skaters. In choosing a shorter distance, another interesting dilemma arose. In a longer race, a handful of strong skaters could potentially profit from working together and breaking away from the main group as often happens in a Tour de France stage. Alternatively, a (strong) team mate could do this several times to force the pack to chase, thereby blunting the sprint of potential rivals, but 16 laps isn’t really enough time to effectively execute any of that strategy. The best thing to do is to sit in the pack, hopefully with a team mate ‘protecting’ you, and sprint at the end. This has the effect of making the laps in the middle of the race rather unexciting. What better way to spice up the middle than to introduce intermediate sprints? The format for intermediate sprints seems to take inspiration from inline skating. In an inline skating “points race” as they are called, there are intermediate sprints every 2 or 3 laps, largely at the discretion of the organisers and often depending on the length of the lap. At these sprints, skaters are awarded points according to their position. At the end of the race the skater with the most points wins. The points distribution has changed over the years – long ago you received 3, 2, and 1 points for 1st, 2nd, and 3rd in the points sprints in the first half of the race, and 5, 3, and 2 points in the last half, with the final sprint having a points distribution like 8, 6, 4, 3, 2, 1 (I’m sure someone with better knowledge of this can correct me, as this was at a time before I went to world championships). It has since changed to being only 2, and 1 points for intermediate sprints and 3, 2, and 1 points for the final sprint. Initially, at junior world cups, the points system followed 5, 3, 2, 1 for intermediate sprints (of which there was only 1) and then 11, 5, 4, 3, 2, 1. This allows a crafty skater to potentially get a bronze medal if they win the intermediate sprint and the third skater across the line at the end of the race also fails to obtain a point at the intermediate sprint. In fact, in view of the final result, the intermediate sprint is quite significant with the winner of the intermediate sprint able to place as high as 2nd depending on the who claims other points from the intermediate sprint and final sprint. There’s nothing wrong with this per se, but it can be confusing to people who are not familiar with points races (the long track community, for example). Again, in the interest of uncomplicated TV-friendliness, the points system was adjusted so that 3rd across the line at the end of the race would be 3rd regardless of what happened in the intermediate sprints. The points breakdown is now 5, 3, 1 for each of the intermediate sprints and 60, 40, 20 for the final sprint. Other small details that were adjusted because of problems which came up at the junior world cups include expansion of the skating area – previously skaters were not allowed to skate in the warm up lane (in the photos above, you can see the innermost lane is marked out of bounds with cones), mostly because it was difficult to enforce. The starting procedure was also changed from a standing start (which was a nightmare because people kept crashing into each other – not something you want to happen when everyone is wearing knives on their feet) to what is effectively a rolling start. So here we are. We have our rules and now some understanding of how they came to be what they are. But what does it all mean? In any given race, if you want to be on the podium, then the only valid strategy is to save yourself for the final sprint and be within striking distance of a top-3 position. The system of intermediate sprints has given us the curious situation that a skater saving everything for the final sprint, and not going for any intermediate sprints is at a very real risk of finishing with no points at all in the event that three skaters are faster at the finishing line – a likely scenario when many more than three fast skaters are sprinting for the line. Taking a point in the intermediate sprints guarantees that you can’t finish any lower than 12th. If only a small number of people take points in the intermediate sprints, or better yet – one or two of the eventual podium finishers take a few of those points, even one measly point from a sprint on lap 4 could potentially get you a very high position, even if an entire pack of 24 skaters crosses the finish line in front of you (provided you don’t get lapped). The lower rankings might not seem very important, but they are. In a series of races, consistency is often more important than the occasional good result. A skater I coached at the junior world cups took advantage of the intermediate sprint (which, especially at junior level, where the distance is even shorter, skaters are reluctant to go for) and consistently came 4th in every race. By the end of the season, he had managed to come second overall. What I’m getting at here is that while picking up the occasional point in an intermediate sprint is very unglamorous, doing so consistently may prove to be a surprisingly effective way to improve a skater’s season-end ranking. Another way to look at this is to think of it as a relatively ‘easy’ and low-risk way to ensure that a skater is in the top 24 at the end of three races – and hence, qualified for the Olympic games. 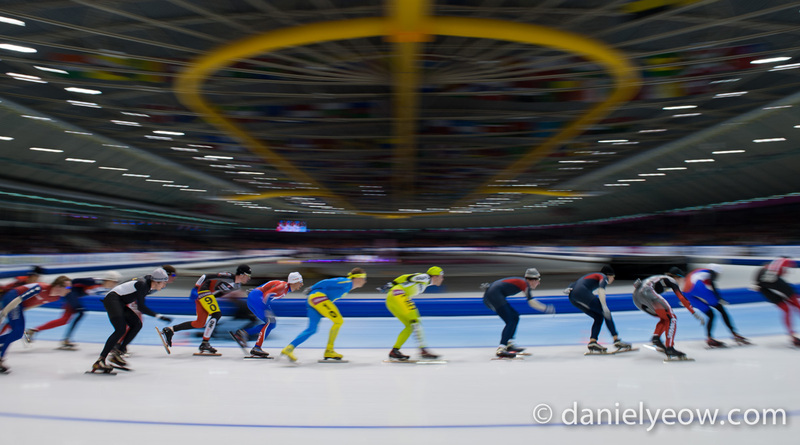 In addition to being quite different in nature to all the individual distances and the team pursuit, the mass start has it’s own slightly relaxed world cup qualifying procedure. Individual distances each have their own qualifying times (they’re fast, and they keep getting faster, much to my dismay). The team pursuit requires that each team member have achieved a qualifying time in an individual distance. The mass start allows one skater per country to be entered who has not achieved a qualifying time in an individual distance, but has achieved a considerably more relaxed 1500m time (2:10 for ladies, and 1:57.5 for men, the ‘normal’ qualifying times are 2:05 and 1:52.5). I believe this was done so that small skating countries with very few skaters and even fewer training facilities (often having to live overseas for some or all of the year, just to be able to train) are able to more easily experience high level competition in long track. The rules have to be elaborated if mass start in speedskating is ever going to have any significant impact on the world wide popularity of this proud, but sadly unfashionable sport compared to other winter sports. Why should this introduced concept make any difference? Try this instead: Make the race slightly longer. Skip the points system in favour of intermediate sprints where you gain a preference in the end sprint. Top two at 3 intermediate sprints get “green lights” (literally speaking). Seperate elimination sprints remove the last two in the field frequently (Red lights literally speaking). Team of two skaters, where both get honours if both gain “green lights” and are not eliminated until – lets say – the last twelve. Otherwise this is a one racer thing. An interesting suggestion. What you describe is similar to the “points elimination” race that takes place at inline speed skating world championships, although I honestly am having trouble understanding your green card distinction. Those with a green card get a preference… but what does that preference get you? It sounds a little bit too complicated for a casual viewer to understand, to be honest. What I would also worry about is that the more complicated you make a race, the harder it is to officiate. In sports like inline skating and short track, where the officials already have plenty of experience with pack-style racing, there are already huge arguments erupting over altercations. I’m quite sure that one of the main reasons the points schema was simplified for the long track mass start was so to make it easier on the officials and to make it easier for the result to be finalised and published quickly. It’s all about managing expectations – in the inline skating world, long waits at the conclusion of the points race while the final results are added, and the officials debate over penalties and disqualifications is considered normal, whereas in long track race results are known almost instantly. The preference means that when you have the final of eight, a varying number of those will have obtained a green LIGHT on either their helmet, or (preferably) a bracelet. If you have just two skaters with a ledlight – or whatever gadget or tecnical device that makes this possible – those two will make up for placings nr. 1 and nr.2 at the finish. The rest will fight for bronze. Hopefully you understand what I mean now! I think I understand, but it seems unnecessarily complicated. Also, in your scenario where two with green lights are on the same team and both get the gold, then doesn’t that make the final sprint less… ‘exciting’, especially for viewers? …In the dutch marathons you have “afsprints”. No such thing in my suggestion. All of the last 8 do the same number of laps. …just a few words more to defend my suggestion: You will always need judges in case of obstructions etc, but the idea of “lights” is to take the idea of simplifation for viewers and athletes further. Lights is also an idea that would make life easier for judges. The background between the stronger tie between middle sprints and the end sprint is to improve entertainment. Todays version is formula based in the sense that it is very common that the titlecontenders hide until that latter stages without having to make any big efforts before that. Breakaways making it from the pack is much more difficult on ice compared to i.e. cycling. If you occationally see it, its sucess is solely dependant on the pack beeing reluctant to chase them – and then you can get very unusual winners indeed, but also synonymous to the best man/woman in mass start? Hmmm. A light-system as described would lead to a dynamically, balanced situation where you have to consider efforts (costs) against what you can gain. My example above is one of the most extreme outcomes – theoretically – of such an event. It will still be exciting for viewers since they know the preconditions before each big effort and each middle sprint. If I understood, intermediate sprints is a mean to frequently score points and to have more chance to qualify for worlds or olympics. I also understood that a race without intermediate sprints is boring but why do skaters sprint at intermediate sprints in worlds or olympics (soon) whereas it is useless for getting a medal ?!!! Do you think really that a skater make a difference between 4th and 24th if the race doesn’t give access to a qualification ? If I join in the race I would prefer to save my energy for trying to have a medal even though I risk to finish last. As long track speed skating often copy track cycling, I would propose a track cycling race that is one of the omnium events. I mean the elimination race. If we take a pack of 26 skaters for a 10K race (25 laps), we would have one skater eliminated at the end of each lap so as to have a sprint between the remaining two skaters for gold at the end of the race. The race won’t be boring as the lasts will sprint to remain in the race and the firsts will try to break away to avoid the intermediate sprints. What do you think about that ? What I would enjoy too is to have finals for gold and for bronze at each time trial distance between the 2 top skaters for gold and the 2 following for bronze. The ones joining in the gold final would have secured silver and the 2 others the 4th place so the outsider in each final could take more risks and adding suspense. It’s practiced in the pursuit and the team pursuit in track cycling and I think ISU could apply this at least for 500, 1000, 1500 and team pursuit. I always thought that is too bad to not have the best 2 skaters in the same race. I mean, you’re right. In the games, if getting a medal is the most important thing, and the other placings don’t matter, then you won’t try for an intermediate sprint. But a lot of people who skate in the mass start know that they’re not going to win, and rather than risk getting no points, and coming last, they try for the intermediate sprints. 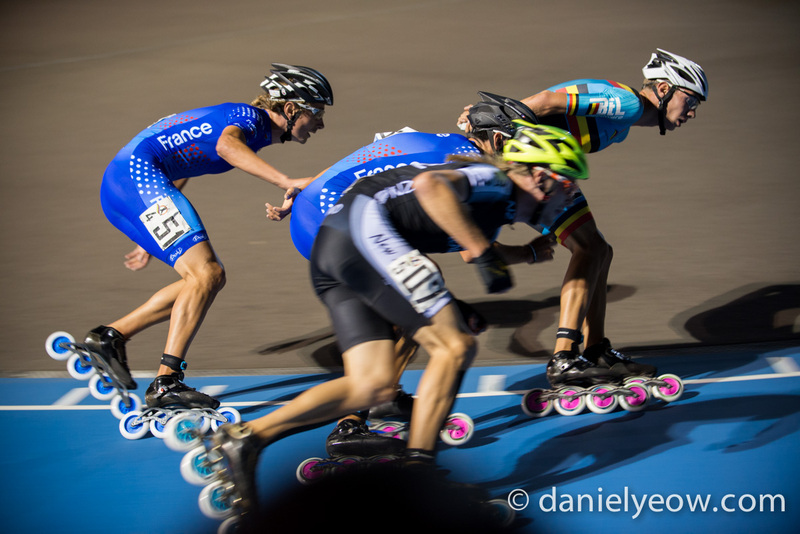 Your other suggestion also exists in the world of inline skating – the elimination race. I like the idea, but getting the ISU to try it is another matter. The organisation is fundamentally very conservative and “traditional” in its outlook (it turned 125 years old this year), so it’s already a small miracle that the mass start became part of the Olympic program. I mean, you can say that, but you could equally say that Brodka would have still won. 3 thousandths of a second is nothing. They both obviously won their pair, so neither of them had the benefit of anyone to chase or to pace themselves with. I arrived here after watching last night’s mass skating event at the Olympics and wondering what the point was of the sprints in the finals. I could see them being useful in the semis, but it seemed pointless for the finals and it made me wonder if an elimination race (one in which someone finishes last in a round would be eliminated). This may be, but wouldn’t an elimination race be able to achieve something similar? The ones knowing they may not finish, would still try to end up as high as possible, as they would in the individual races. While I thoroughly enjoyed last night’s races, it seems to me there could be more excitement if it was an elimination race rather than one with seemingly meaningless sprints and people just holding off until the final few laps (or at least in the Olympic final race). Instead of points in the 3 Sprint laps, why not have 2 racers that were last in each sprint lap be eliminated? That way there is a true motivation for everyone to sprint that lap and it would also significantly speed up the whole race itself. Not to mention the added excitement for the spectators! I get the idea of giving points to each sprint. But thats all very nice in the qualifying stages. But in the final, if you give the final winner 60 points, then whats the point in winning any of the early sprints. Why not make an early sprint win worth it e.g. give that 25 points so that a sprint winner who comes 2nd will still win Gold (and match the other point systems also e.g. coming 3rd place in 3 races can still get you a bronze medal) … make the sprints part of the race not just a pointless race of no value.